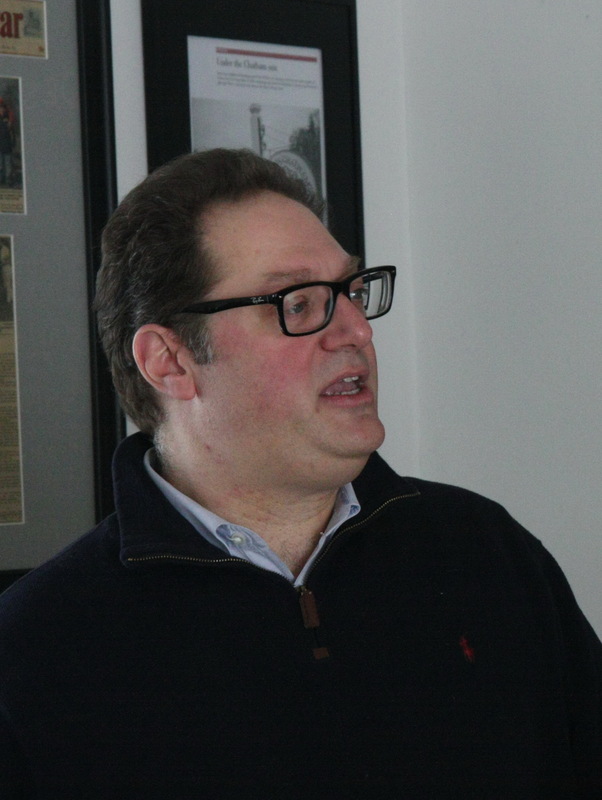 Carlo DeVito works as a publisher and editor in New York City, is the author of several books, including East Coast Wineries: A Complete Guide from Maine to Virginia (Rutgers U. 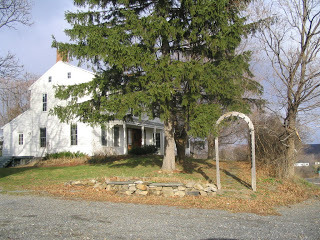 Press, 2004), maintains a few blogs, principal among them is East Coast Wineries, and commutes home every day to Ghent, NY, where his winery and vineyard are located. Carlo is clearly a very busy man as well as a humorous one. Visit his blog and read his post for March 16: The Difference Between Beer People and Wine People . . . especially here on the East Coast.” It’s about dogs, too, but read the post for yourself. Another of his blogs is Hudson River Valley Wineries, which Carlo uses to publicize the sagas, tales, wines, and personalities of the region. Hudson-Chatham Winery, in Ghent, NY (in Columbia County, to the east of the Hudson River) was established in 2007, soon after Carlo and Dominique, his wife, purchased the property—the last fifteen acres of what was once a 500-acre dairy farm—that had been left fallow for more than twenty years. The couple had been in search of a property with which they could realize the dream of having a winery and vineyard, and after a long and extended tour of parts of the East Coast, they had found what they wanted. One of Carlo’s criteria for the location was that it be in what was already an established winegrowing community. As he pointed out, in the wine trade, at least in the East, people aren’t cutthroat competitors but rather cooperative and helpful ones. After all, virtually all of the wineries of the Hudson River Region are very small operations. They all need one another. That mattered a great deal to Carlo. Soon after they’d started the vineyard, he had the great good fortune to meet Steve Casscles, who has two vineyard of his own and grows some obscure heirloom varieties. Chatham-Hudson presently buys the entire production of Steve’s vineyards for its table-wine grapes. As a result, Hudson-Chatham has also helped bring back Chelois—Steve is the winemaker, after all—along with Léon Millot and Dutchess—hybrids all. Another vineyard, managed by the winery, in Kinderhook grows grapes to go into its Port and Sherry-style fortified wines. Yet another plot in Central New York provides most of the old-vine Baco Noir for the winery. Meanwhile, Carlo is planting his own vineyard to Seyval Blanc, Chelois, and Baco Noir with the idea that eventually most if not all of the wines will be estate-produced. This is being phased in over time as production increases. By the end of Spring 2014 there will be 5 ½ to 6 acres planted to vines, with Baco Noir making up a third of that, and Chelois another third. In time some vinifera varieties will be grown as well, such as Riesling, Cabernet Franc, and even Gamay. Carlo would like to grow Pinot Noir as well, but doesn’t believe that it would thrive on his site, but he may purchase fruit from a vineyard in Columbia County further south and close to the River. In fact, the winery buys its Cabernet Franc from Long Island, and it makes a “Burgundy-style” wine—actually a lighter kind of red wine than is usual for the variety. Indeed, Carlo prefers the lighter Burgundy style for all his reds, regardless of the variety. So Cabernet Sauvignon, Malbec, Syrah, and other varieties that make heavier, bigger wines will not be part of the winery portfolio. The predominant spacing in the vineyard is 8 ½ feet across by 6 between the vines; with vinifera it will be 8 feet by 4. Lucie Morton and others have demonstrated great success with the closer spacing of the vines—more vines per acre but less fruit on each vine by means of green harvesting. The resultant fruit is really fantastic. For now, all the trellising in the vineyard is VSP, though Greg Esch, the new vineyard manager, has some ideas about using different trellises for the newer varieties that will be planted. In fact, according to Carlo, there are issues with some of the hybrids. For example, Baco Noir “has some riparia in it so that it tends to grow kind of wild pretty quickly,” whereas Seyval Blanc has more vinifera in its genes and grows straight up and develops a nice fruiting zone. Baco grows in every possible direction so that it needs a good deal of hands-on attention. Clearly, the Baco is a candidate for another kind of trellis than VSP, whereas Seyval works very well with it. The same will be true of the Chelois. According to Carlo, shale and river rock predominate in the schisty soil of the property. With respect to sustainable practices in the vineyard, Carlo pointed out that his is a family farm, which is to say that his wife, his children, his pets, and he like to walk the property, including in the vines. Furthermore, there’s a pond nearby with brook trout; “If I leach, there are a lot of dead fish across the street.” He therefore uses inputs in the field as lightly as possible, including copper and sulfur. He wants his family to stay healthy, the trout to live, and the vines to thrive, so he is very careful with what he uses. He is not seeking to become organic, it’s too difficult to do successfully where he is. Just as close to it as possible. Since Greg has come on board there’s been a great deal more leaf-pulling, hedging than before, resulting in a much better crop without requiring additional inputs. That wasn’t just because of the weather, as it also had to do with using netting for the first time (to protect the grapes from birds), and employing a number of other “best practices.” It was really a matter of not having the hands available to do that kind of work before this, and what Greg has done has yielded immediate results. Still, there are pest pressures all the time, if not from birds then from deer and groundhogs. Dogs and cats are useful here. We discussed chickens as a possible means of controlling insects, but for a long time there were too many foxes. Now the foxes seem to have disappeared and the groundhog population has exploded. At least now chickens are again a possibility. It should be noted that for such a new micro-winery as Hudson-Chatham the results that it achieves in competitions is remarkable. In last year’s (2013) Hudson Valley Wine and Spirits Competition, its 2010 Merlot Reserve won both a Double Gold and Best in Show. That wine and the 2007 Merlot were both made from Long Island fruit (Merlot grows very well there), and the 2007 won the highest score of any Hudson Valley-made red: 85 points. That certainly reflects the outstanding winemaking skills of Steve Casscles. Other wines include Cabernet Franc and Cabernet Sauvignon, also made from Long Island grapes, and a Riesling the fruit of which was sourced from the Finger Lakes. The Hudson RIver vineyards that provide fruit to the winery include Casscles Vineyard in Athens (14 acres across the river), Casscles MIddlehope, near Marlboro (4 acres, also across the river), Kinderhook AC Vineyard (1 acre in Columbia County), Masson Place Vineyard at Pultney Farm, near Hammondsport (5 acres, Lake Keuka in the Finger Lakes), and the estate vineyard, North Creek, located at the winery. More recently, the March 2017 issue of Wine Enthusiast Magazine rated the 2014 Middlehope Casscles Vineyard Baco Noir (Hudson River Region) at 91 points, referring to its “surprising depth and complexity.” It awarded 90 points to the 2014 Columbia County Pinot Noir (Hudson River Region) for its “complexity . . . and neatly balanced yet silken palate.” The 2014 Old Vines Masson Place Vineyard Pulteney Farm Baco Noir won 88 points as did the 2014 Reserve Casscles Vineyard Baco Noir. The 2014 Casscles Chelois got 87 points–all highly respectable to excellent ratings for the outstanding 2014 vintage. Hudson Valley grapes are used for all the hybrid-based wines. Two different Seyval Blancs—one of which is estate-bottled; one called Salmagundi, a blush wine made from Vidal Blanc and DeChaunac; a Baco Noir Reserve Casscles Vineyards and a Baco Noir made from 60-year-old vines from Mason Place Vineyards at Putney Farms; and a Casscels Vineyards Chelois. One wine, the Empire, is what the winery calls a New York State super-blend, which claims to be the first wine made from grapes from all three AVAs of the Empire State: Merlot from LI, Cab Franc from the Finger Lakes, and Hudson Valley Baco Noir. Many of these have also won awards, including gold medals from the NY State Fair, Hudson Valley Wine & Grape Association, NY Food & Wine Classic, and the Dallas Morning News Wine Competition, among others. It has been positively reviewed by Wine Spectator, Wine Enthusiast, Edible Manhattan, Hudson Valley Wine magazine, Hudson Valley Magazine, Hudson Valley Table, Rural Intelligence, and All Over Albany. It should be pointed out that the Merlot and Empire wines are the only ones that have the body and weight of Bordeaux reds, the others are all done with the heft of Burgundies, which is to say, lighter in body. 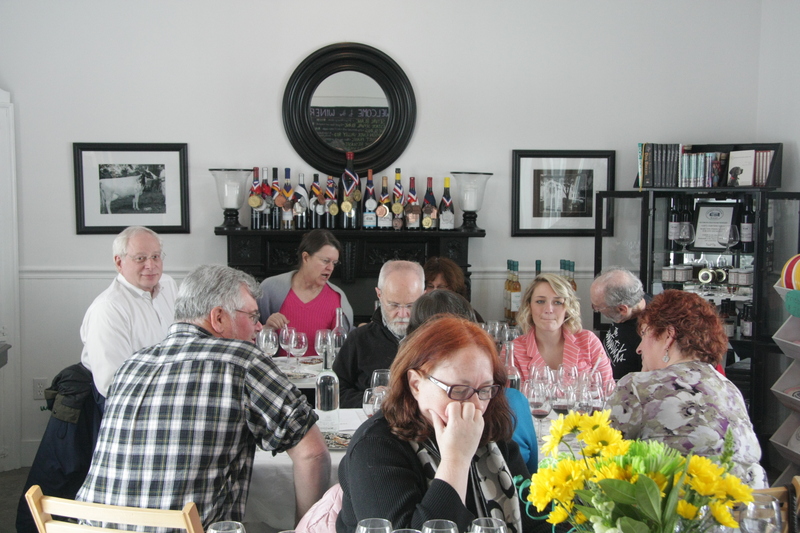 The tasting room is a cozy, attractive space where interesting events can happen, such as a vertical tasting of Chelois. On a Saturday in March they served a 2013 out of the barrel, 2012, 2011, 2010, 2000, and 1987. I’d no idea about Chelois, but I certainly do now, and in fact I bought a couple of bottles of the 2010. A fascinating range of aromas, flavors, color, and structure, and who would have believed that Chelois could age and last as well as it did? Vertical tastings of the Empire blend and the Merlot are planned as well. For only $25, a reservation to one of these events is well worth while, for they are both instructive and very enjoyable. Not too many wineries offer verticals, to my knowledge. Not bad for a small winery run by a publisher who works in New York City. He now needs to update his book, East Coast Wineries, and include Hudson-Chatham in it. Being a publisher, it should be easy. 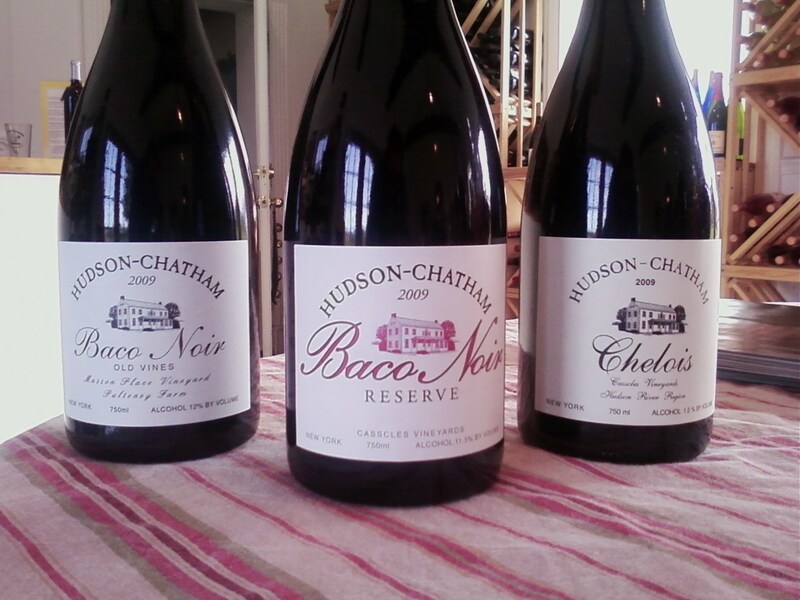 One more thing: If anyone is curious to know what happens when you buy property to create a winery and vineyard, the Hudson-Chatham Wine Blog is the place to go. It’s informative and hilarious in equal measure. You’ll find the link under Our Blogs: Winery News. It covers the history going back to 2006 and continues on through the present. This entry was posted in Vineyards, Viticulture, Wineries and tagged Baco Noir, Carlo DeVito, Chelois, Greg Esch, Hudson River Region AVA, Hudson River Valley, Hudson Valley wine, Hudson-Chatham Winery, hybrid grapes, Seyval Blanc, Steven Casscles, Tannersville, vertical tasting on 20 August 2017 by JoseM-L.